These Farm Heroes level 180 cheats and tips will help you beat level 180 of Farm Heroes. 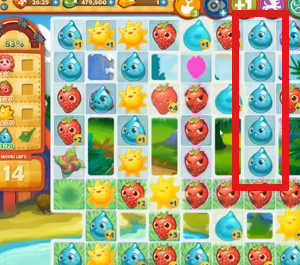 The objective of Farm Heroes level 180 is to collect 4 flowers, 70 strawberries, 70 suns, and 70 droplets in 24 moves. There is a very long way to go until you reach 100% growth, so concentrate on making as many matches in the grassy areas as you can. These will add bonuses to your cropsies and help speed you on your way. 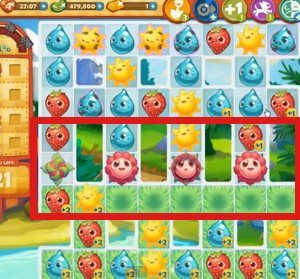 In this level, your biggest immediate obstacles are the flowers, since they are blocking cropsies from falling into the grassy area at the bottom. The longer they are there, the more your cropsies will be exposed to grumpiness from above. Make matches in the narrow channels to open the flowers and remove them quickly. You may also make matches below, but as this will leave empty spaces in the grass, you should think carefully before making a move there before at least one of the flowers is removed. Even if you can’t make any matches in the grass, you can still get bonuses by making matches of 4 and 5 to add values to cropsies nearby. This is also more likely to set off a cascade, which will give you “free” matches without using an extra turn. If you’re being swarmed with grumpy cropsies, try to set off a cascade that will send them to the bottom, where that can be cheered up by grass. 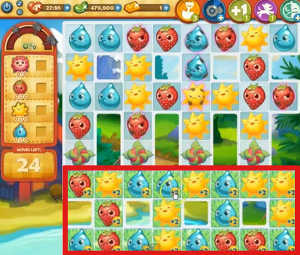 This will help you beat Farm Heroes Saga Level 180 and keep progressing in the game!